SAN FRANCISCO, CA--(Marketwire - September 18, 2007) - Cake Financial Corporation today unveiled a new, free online financial service that changes the way individual investors can track and make decisions about their investments. Cake lets investors securely gain insights from the power of actual investment portfolios and makes it easy to follow the trades of top-performing individual investors and, trusted family and friends. The service helps investors turn the "wisdom of crowds" into trusted, contextual investment guidance. Cake Financial was one of only 40 companies invited to launch its new service at the inaugural TechCrunch40 Conference in San Francisco. Specifically designed with the 40 million Gen X and Gen Y consumers in mind, Cake is a new kind of financial service. Members can open an account with Cake in minutes because there is no transfer of money or change in existing brokerage relationships to get started. Instead, members can link their Cake account to an unlimited number of existing portfolios from leading online brokerage firms. This allows Cake community members to see up to 10 years of historical activity as well as current portfolio holdings, trading activity and performance data of fellow members. All safely, securely and anonymously. A recent study from the Harvard Business School reveals that many ordinary investors consistently beat the market. Cake is designed to allow members to capture and share the behavior and habits of these high performers with each other. "Cake Financial is the first financial services site to harness the wisdom of crowds in making investment decisions," said Joshua D. Coval, Professor of Business Administration, Harvard Business School. "By aggregating holdings and performance information across a wide range of investors, Cake can allow users to identify and learn from the subset of investors that make consistently good investment decisions." Some 90 million Americans now seek wealth in the stock market, making this once bastion of the wealthy a truly democratic institution. But while access to the markets has become easier, the investment industry can do a much better job of serving individual investors. According to widely accepted academic research by Arnott et al almost 90 percent of mutual funds fail to beat the stock market's returns in a typical year. And, 65 percent of investors believe "financial advisors and advisory firms put their own interests ahead of their clients," according to the Annual Securities Industry Association Investor Survey on Attitudes Towards the Securities Industry. "Cake democratizes investing by enabling individuals to share successful strategies with each other," said Stewart Alsop, co-founder of Alsop/Louie Partners, an investor in Cake Financial. "It allows individuals to bypass the so-called experts employed by brokerage firms, who really don't know any more than you and me." Cake lets members monitor and learn from the actual, aggregated portfolio performance of top-performing investors. For free. Cake members can automatically track their performance across all existing accounts, with access to detailed information from popular online brokerage houses, such as Charles Schwab, Fidelity, E*TRADE, and more, without revealing private information. Members can also compare and validate their overall performance against the performance of friends, family, and other Cake members. Cake is the first online financial service with robust account aggregation that provides up to 10 years of historical performance and activity, not just a few months. Members can also set up alerts to see the actual trades of people in their network. Cake's state-of-the-art security infrastructure is similar to those used by trusted online banks and brokerage firms. "There's little evidence that investment professionals and pundits are any better than the rest of us at selecting stocks that outperform, and mutual funds touted by various financial magazines often fail to perform as well as the market," said Steven Carpenter, CEO of Cake Financial. "Cake Financial is designed to free investors from an industry that fails to offer transparency by empowering individuals with information to overcome these well-documented industry shortcomings." Headquartered in San Francisco, Cake Financial Corporation is a free online investment service that makes it easy for its members to follow the portfolios and trades of top-performing investors and trusted family and friends. Only Cake lets investors securely gain insights from the power of actual portfolios and trades of fellow members, providing unprecedented transparency while respecting members' privacy. 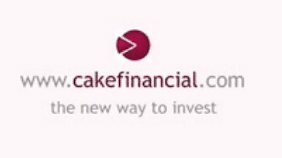 Cake Financial is backed by Alsop Louie Partners and a number of angel investors including Ron Conway and Baseline Ventures. For more information, visit www.cakefinancial.com.